Unknown to the current president of the United States and white supremacists is a primary source of America’s greatness—immigration. As I mentioned in a previous blog entitled, “American Greatness, A Reality Check,” we tend to think our greatness rests in military might and money, but it does not. The greatness of America is rooted in ideas such as liberty, freedom and opportunity and in the people with the courage to make such ideas the foundation of their lives. History calls these courageous people—immigrants. America is primarily a country of immigrants. George Washington may have been born in the colonies, but trace his family tree, and you will discover he was not a Native American. In fact, unless your descendents were indigenous people, you are either an immigrant or a descendent of immigrants. My family came from Cornwall in Great Britain where they were miners. They settled in the Upper Peninsula of Michigan where they worked in the copper mines near Calumet and Copper Harbor. You may be able to trace your family estate to European land grants that date to the 1500’s, but you are still of immigrant stock. I remember my diversity training when I worked in the corporate world. The premise was that when people come together from different cultural backgrounds, varied religions, skin color, languages, etc., they bring different worldviews. When different worldviews are not just tolerated but embraced and given credence, the diversity begets creativity. When a company or a country allows the different worldviews to impact it, greatness is the result. This is the power of diversity and of immigration, for people of varied cultures, religions, languages, and ethnicity bring qualities and perspectives that the current inhabitants of the United States do not possess. The truth is we need these new perspectives. They open our eyes and minds to new dimensions of greatness. In America, the tendency has been to resist new cultures and viewpoints. We have a history of denigrating those perceived to be different from “us.” Consider the people persecuted in the past centuries: the Irish, Italians, Jews, Catholics, Chinese, American citizens of Japanese heritage. Consider the prejudice that continues for women, African Americans, members of the LGBT community and Muslims. We fear diversity and differing viewpoints, but it is the diversity of immigration that makes us great. The good news is that we have a history of overcoming our fears. However, it is time to consciously acknowledge an unknown source what makes our country great. Sameness does not contribute to greatness. Whiteness does not make America great. Diversity and more specifically the acceptance of diversity and an attitude of curiosity toward differing worldviews make for greatness. American greatness is diminishing. As we close the door to people with different worldviews, we close the door to creativity and greatness. Fear is shrinking our minds and clouding our understanding. Because some people of color or people of a specific religion or nationality strike at Americans and American interests, we devise ways to protect ourselves. We can thank our national leaders for their commitment to keep us safe, but we must not sacrifice a source of American greatness for safety. We fear those who might come from afar and harm us, and so, understandably, we want to close the door, so they cannot hurt us. I understand, but fear must not dominate us and cause us to forget one of the sources of the greatness of the nation. The fear of attack is driving our current immigration policy, but so are attitudes of racism, bigotry and white supremacy. Nothing is more dangerous than these attitudes, for it places the threat within our borders rather than beyond them. This danger is not hushed and hateful voices in a cave in Afghanistan or in the leadership of a rogue government. This danger lives in the United States in attitudes of separation and superiority, in the belief that God’s favorite color is white, that God’s preferred religion is Christianity and that God speaks with an English accent. These beliefs and attitudes are more dangerous than 9/11, for they appeals to the worse in us, the part that thinks there is only one way and only a certain kind of people who can be Americans. America is not a country of white men. It is a country of immigrants of rainbow colors who come not just to partake in the American dream of freedom and prosperity, but also to contribute new perspectives that expand America’s greatness. 2017 has been a year of chaos. Let 2018 be a year of remembering. Let us bring to mind an unknown source of American greatness. 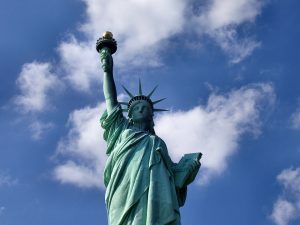 Let us find the balance between homeland security and allowing new worldviews to cause the scales to fall from our eyes as we see the value of those who speak a different language, pray prayers unknown to us, who trace their roots to ancient cultures and yet who value the ideals of freedom and liberty. As always, well said, Jim! The current trend is a manipulation and distraction that serves as cover for greedy policies that are damaging our institutions, progress, security (on so many levels!) and credibility. My prayers are ongoing. Thanks for your voice. Our local television station, WRAL-TV, recently aired a documentary about the importance of immigration to North Carolina society and economy. It can be accessed online and is well worth watching. Thank you, Jim, for sharing your ideas. You bring up many good points. grilled food Fantastic submit. I’d been verifying consistently this site for influenced! Useful information specially the very last aspect 🙂 We deal with these information a great deal. I was seeking this specific specified information and facts for your period of time. Many thanks and also best of luck.